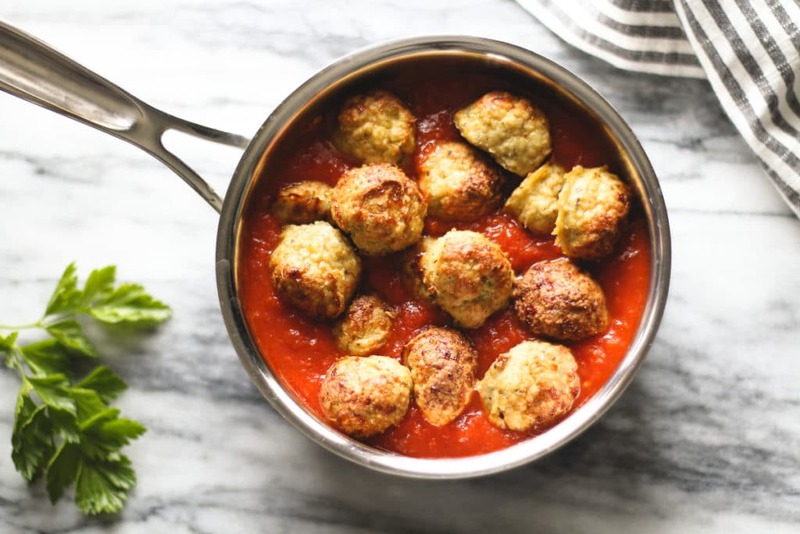 Gluten-free Baked Chicken Meatballs » Easy & Freezable! 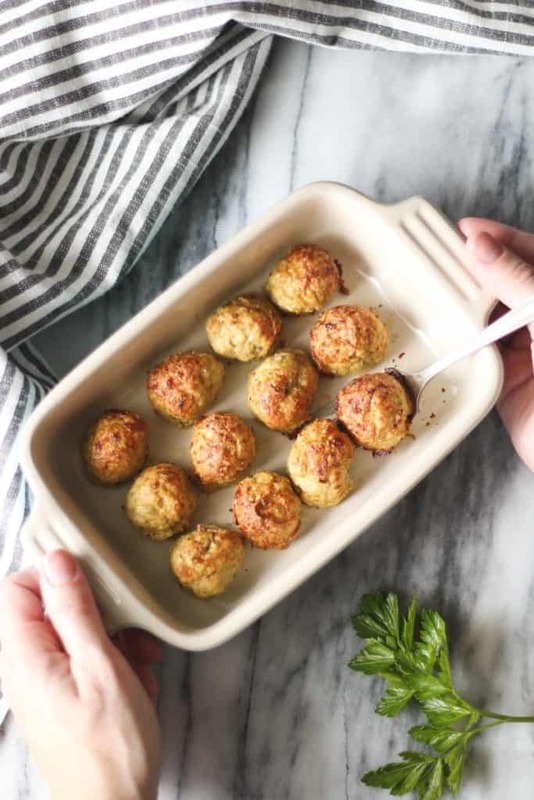 Who knew an easy to make, baked chicken meatball could be so stinking delicious?! Really easy to throw together. Packed with a lot of flavor! Not only are these so, so easy to make, the ingredients are mostly pantry items! Which I think we can all agree is awesome. All I had to pick up from the store to make these was ground chicken! 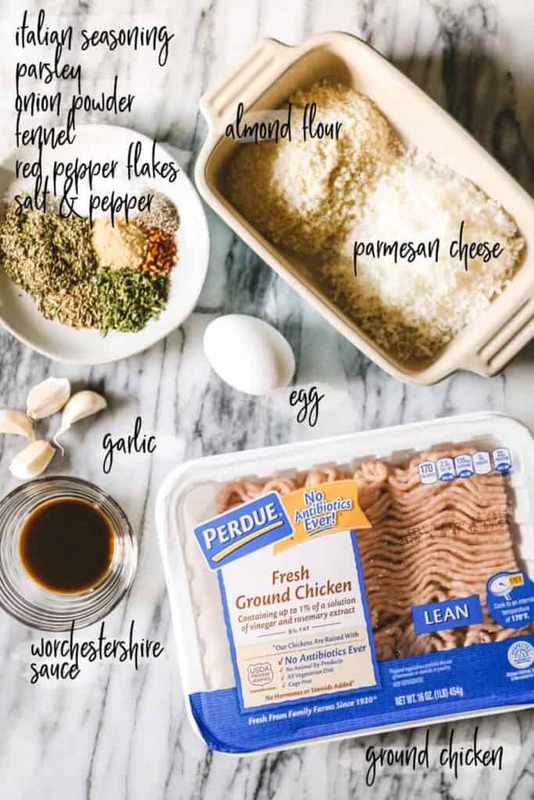 (You can also use ground turkey). 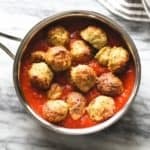 Ground chicken is the star of this meatball show for a two reasons… my husband is cutting out pork and I just like chicken! I obviously make them gluten-free, but you could substitute regular breadcrumbs without a problem. Dried spices: fennel adds that ‘Italian sausage’ flavor, Italian seasoning, parsley, onion powder, salt & pepper. Garlic: I used fresh garlic because I love it, you could use garlic powder if you wanted to. Worchestershire sauce: make sure yours is gluten-free. I used Lea & Perrin’s brand. Egg: which helps hold it all together. Almond Flour: is also a binder. Gluten-free panko or gluten-free breadcrumbs work as well. Parmesan cheese: because why not parmesan cheese? Freshly grated is my preference. Are you even ready for this? This could not get any easier. 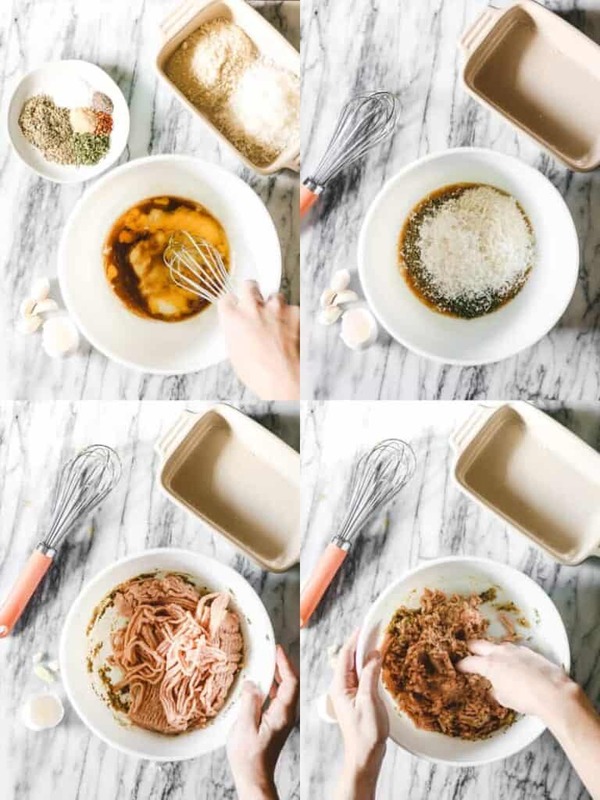 Stir the wet ingredients together. Add in the dry ingredients and mix to combine. Mix in the ground chicken with your hands. Be sure to wash your hands and remove your rings first! To form the meatballs, I use a small cookie scoop! It’s about 1 Tablespoon in size. 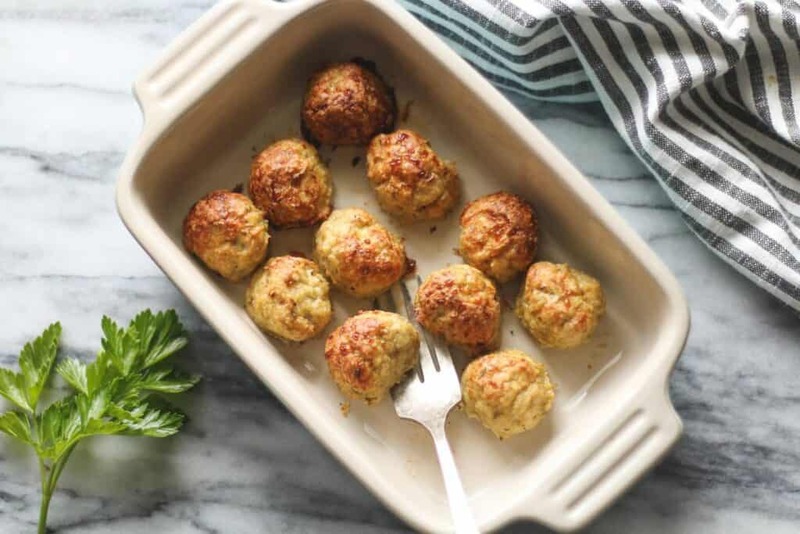 Just scoop out the little meatballs onto a parchment-lined baking sheet and bake! And so, so hard to resist. I mean seriously. I ate one… or two… or like, ten actually. There should be a warning. Warning: It may be hard to resist eating ‘Baked Chicken Meatballs’ straight from the oven. Eating just one will require much restraint. In the event that the meatballs need to actually make it to the dinner table, baking a double-batch is highly advisable. I then warm the two up together. If the meatballs are frozen you don’t need to thaw them first. Then I serve it all over our favorite pasta! Speaking of freezing, you can absolutely make a big batch of these and freeze them for future use. I actually highly recommend this! Just store them in an airtight container. 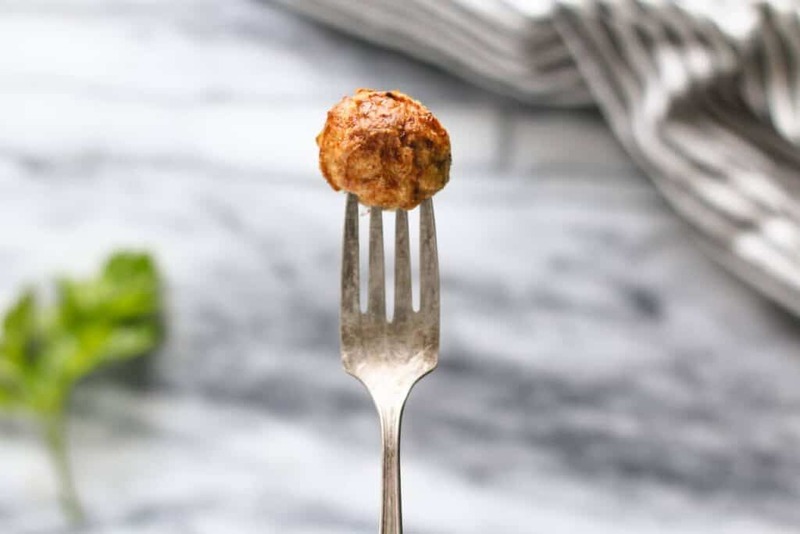 Baked Chicken Meatballs are gluten-free, pork-free, full of flavor, easy to make, & freezer friendly! Preheat the oven to 425°F. (Use convection setting if you have it.). Line a baking sheet with parchment paper. Whisk the egg, olive oil, and Worcestershire sauce together. Whisk in the dry ingredients: almond flour, parmesan cheese, and spices. Add in the ground chicken. Mix well with hands until mixture is combined. 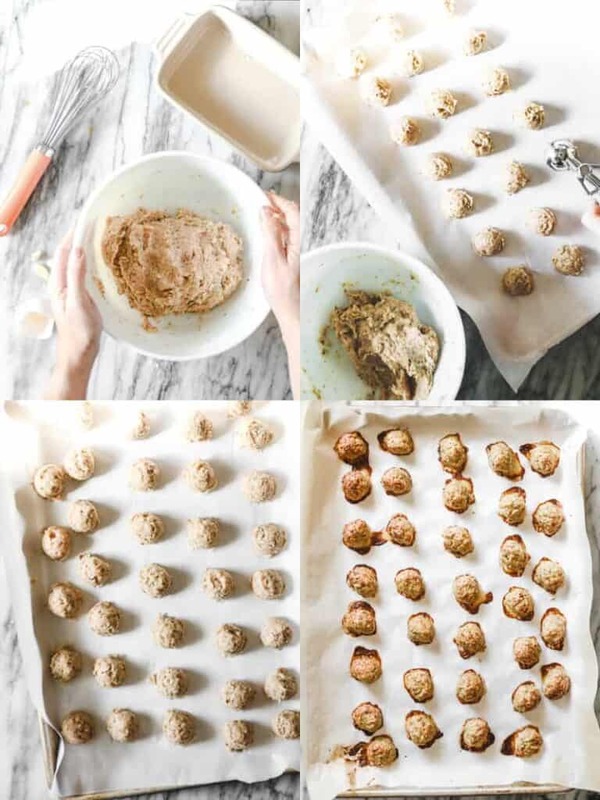 Using a small cookie scoop, scoop out 1 Tablespoon-sized balls of the mixture and place the meatballs on the parchment lined baking pan. Bake at 425° for 20-25 min or until meatballs are golden brown and cooked to 165° internal temperature. Use immediately, refrigerate for up to 3 days, or freeze for several months. 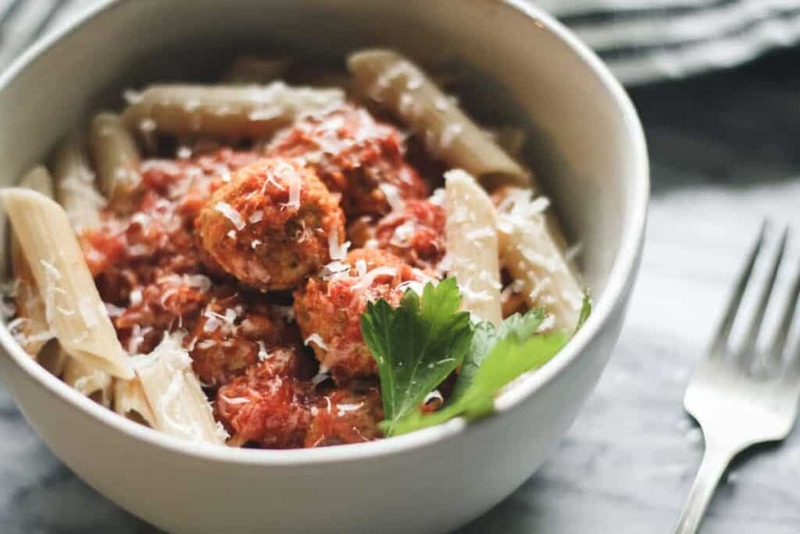 When warming them up in pasta sauce, frozen meatballs don't need to be thawed first. I sincerely hope you enjoy this baked chicken meatball recipe! If you do, please share this recipe on your favorite social media channels! Also, leave me a comment and star-rating! All these things help my recipes to be recognized by Google! Thanks for your support!